While it’s not normal for kids that are only five or six years old to reach out to car companies when a child shows an interest and an enthusiasm for something, parents are often quick to help them understand the possibilities. One youngster, Patch Hurty, already has a wonderful story to tell and something that will be special to him for years to come. Patch enjoys watching cars pass his home and loves the look and the sounds of the different cars, but he was most excited when he found a Ford badge that had fallen off. It would be difficult to expect badges to fall off in front of the Hurty house on a regular basis, but Patch’s mom, Lindsay, was more than willing to help her son send out a pitch to different car companies to try and see if he could build a collection of car badges. The pitch included a letter, a coin from his piggy bank, and a photo of Patch in front of one of the cars from that company if one was nearby or available. While it seems this would be a long shot, and not savvy in a technology-based world, Patch was able to receive a huge surprise. There’s no doubt that it would be simple enough for the car companies of the world to ignore the request for a badge from a child and simply move on, but that wasn’t the case. After contacting nearly fifty companies, Patch has received responses and more than just badges from many of the companies. The coins were often returned to him along with a letter, a badge, and several other items from the companies he contacted with his interesting request. 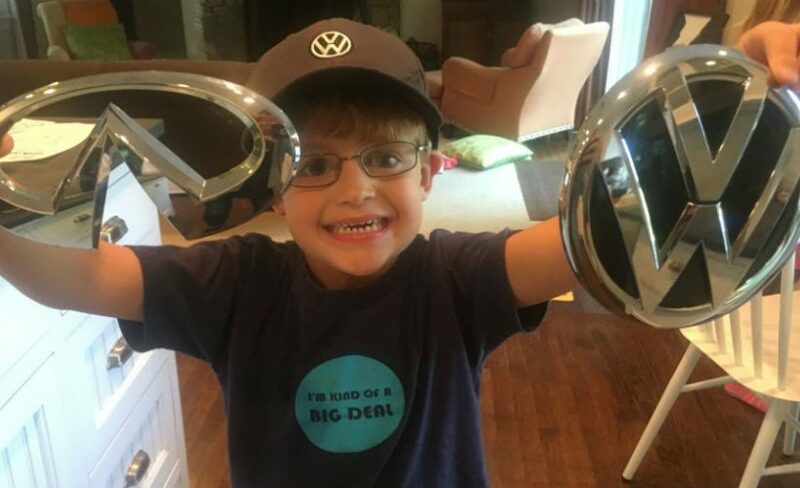 Volvo sent a huge grill badge, a Frisbee, and several other items; Jeep apologized for not having badges but sent a metal sign, a hat, a pen, and a keychain; Bentley sent a center cap from a wheel; BMW sent a note and a new BMW emblem; and many others responded as well. He received an original pencil sketch of a Continental from Lincoln and brands that no longer sell cars in the US sent him items including a Suzuki key chain and stickers and a couple of Hot Wheels-sized Isuzu commercial trucks that he can enjoy playing with at home. It’s no secret that with the widespread use of Uber, Lyft, and other ride-hailing apps, and the increased age at which the younger generation is receiving their driver’s license, the automotive world is feeling pressure to attract the younger drivers. When contacted by a child who is already excited about cars, this is the right way for the automotive industry to keep a person like Patch as an avid fan and someone who may own several cars when he is older and has the opportunity to share his new collection with his own kids later in life.